Alien landscapes, rare corals, biblical places and a city lost somewhere in the rocks are not all points of interest of the Hashemite Kingdom of Jordan. Being located in a region of conflict (Jordan is bordered by Saudi Arabia to the east and south, Iraq to the north-east, Syria to the north, Israel, Palestine to the west) Jordan, however, is a safe place to visit and enjoy. The climate is dry and warm most of the year, but the best time for the journey is spring and autumn. Anyway, TakeTones went to Jordan in winter and never regretted! Despite that more than 90% of Jordanian territory are deserts and semi-deserts, there are lovely oases of green gardens, flowers, and beach line. Jordanian coastline is only 26 km, and that's thanks to the Jordanian King Hussein who exchanged 6,000 sq.km of a desert for 12 km of the Red Sea coast with Saudi Arabia. Aqaba - in the south of Jordan - is the greatest place to go for vacations. Divers will be pleasantly surprised by the diversity of marine life and crystal clear warm water. Besides the Red Sea, Jordan has access to another one - the Dead Sea. Well, in fact, it's a great salt lake that is one of Earth's unique places. First, it's the lowest point on Earth - the shore of the Dead Sea lies at 1,378ft (420m) beneath sea level. Second - it's about 10 times as salty as the ocean and this makes the Dead Sea a natural health resort. In case of any skin ailments even soaking in the water of the Dead Sea will be effective. Jordan is home to many biblical places including the Jordan River where Jesus was baptized by John the Baptist, Mount Nebo where Moses died, and the sinful cities of Sodom and Gomorrah (which were, by the way, in the south shore of the Dead Sea). 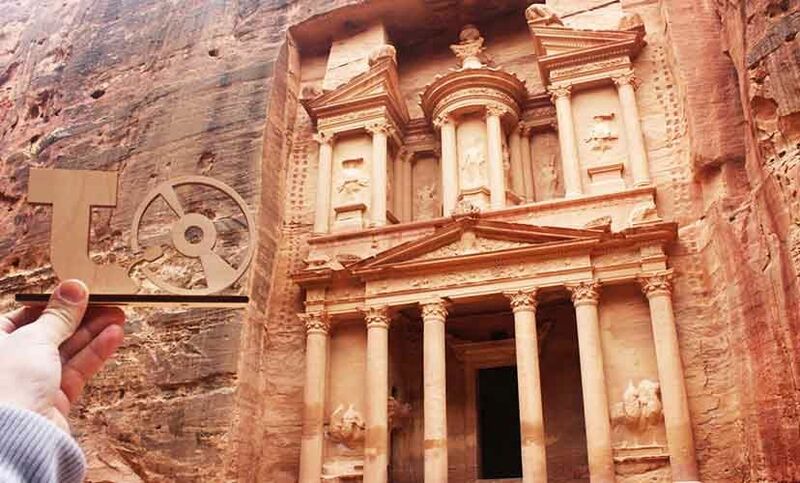 Moreover, Jordan is famous for the Rose City of Petra - one of the New 7 Wonders of the World. This is the capital of Nabataean Kingdom, carved into the rocks as early as the 4th century BC. You've probably seen this picture before - the final scenes from Indiana Jones and the Last Crusade were filmed at Petra, and "The Treasury" was the location of the Holy Grail. In addition to all this, there are many other fascinating places in Jordan. The capital Amman, which may be one of the oldest cities on the planet, Jerash, ancient Roman city, Wadi Rum desert, and Ma'In hot springs to name a few. But the best part is, of course, people. Jordanians are very welcoming and friendly. Merchants in shops will offer you a cup of tea with cinnamon or fantastic Jordanian coffee with cardamon. Local passersby will gladly help you if you lose the way and hotel staff is careful and always pleased to assist you. Jordan is a wonderful destination for any kind of vacation that seems to have everything! TakeTones had a perfect time there and wishes you the same.